For all the Results, please click here. It has been a year now since I last organized a series tournament. In the meantime there were two such tournaments, organized by Cornel Pacurar, which were most interesting and fun. More info about them can be found here. All the series tournaments so far turned out so great, that I finally decided to organize one more time. It will be a little bit smaller in scope, having two main categories instead of the usual four, nevertheless, I think it should give some spectacular results and matrices. A certain trend in series tournaments is to let more and more freedom to the composers. For example, in the first ones a few years ago, the themes were often to find the longest series help-stalemate ending with certain specific positions. This in itself is very interesting, and the matrices found in those tournaments showed that even with such constraints, it is possible to find a lot of original ideas. Then more and more it was no more about the exact final position, but on certain global objectives to achieve. For example to end with only a King and Bishop for one side, and a King for the other. Or even about rare stipulations that have rarely been studied before, like Cornel's TT1. Recently, even the stipulations and conditions have been relaxed, as an example given by Cornel's TT2, where almost anything was allowed, but given a goal that was almost never been studied, and thus giving original problems. This tournament follows this trend, and the theme chosen is very broad. 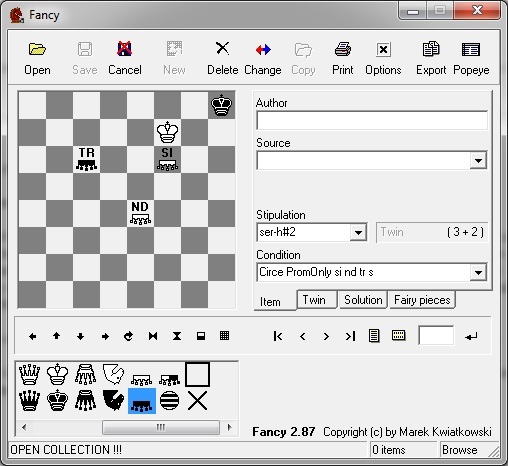 It should give a lot of freedom for composers to find original ideas, and enjoy the process of composing chess problems. It is clear that chess composition is an art, and a beautiful one that I learned to respect a lot. Although I have very little experience in it, and mostly in the Proof Games area, where it took me a few years after I started in 2005 to really understand it a little bit better. And in Series problems, mainly through the tournaments I participated and organized since then. http://www.ifaybish.com/tournament5/ (notice it is recursive, you will have to go several pages back to gather informations) for more info. Mechanical puzzles for the first places in the different categories and to the 1st in the table of the number of records for the categories A2, B2. The tournament will last 2 months. Computers are only allowed in order to test the validity of a humanly found solution, that is to make it C+. 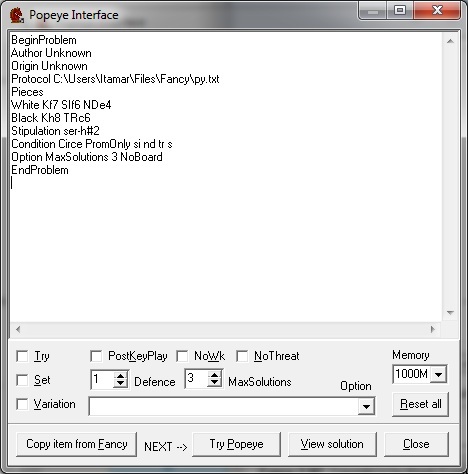 Programs like Popeye and WinChloë are ok.
During the course of the tournament, computers are not allowed to be used for composing (that is, to "solve" or find good solutions). It is only allowed after the tournament. This needs a small clarification, of course, if one analyzes a specific position with a program, and finds other solutions (duals) which are good/better, this is ok to search further! It is the automatic search for solutions that is not allowed. Thus scripting in any way Popeye for example is also not allowed. For this tournament, queens are replaced by Sirens, rooks by Tritons, and bishops by Nereïdes. Knights and pawns are allowed as usual. Those pieces are supported by Popeye and Fancy. They are called the marines ones. Their movements are very easy, being the same as their counterpart, except that they capture by jumping over the other pieces, on the square just after them (which must be vacant). ser-h= Black plays always, except on the last move where White plays and stalemates Black. ser-h# Black plays always, except on the last move where White plays and checkmates Black. ser-h!= Black plays always, except on the last move where White plays and stalemates itself. The aim being to find the longest games, using any of those stipulations, with the less total number of pieces. One must have at least one marine piece for Black which must make at least one move during the solution, and one for White (which doesn't necessarily have to move last), in the initial position. Every piece must have a purpose, thus removing any one of them must invalidate the solution. In addition, the condition: Circe, must be used. And the solution must not work without it. Maximum 5 pieces in total for Black initially. For Black only, one cannot replace any marine piece with their counterpart, and have the exact same solution. For White it is allowed. In the news page all the info about the records will be given, except the stipulation used. Thus this will remain a mystery until the very end. Before it is asked: yes, promotions are ok! But only to the allowed pieces of course. The black king is allowed to be in check in the initial position. White's last move must be legal. For all, only non-promoted pieces initially. By that is meant just one siren, two tritons, and two Nereïdes maximum initially for each side. Nereïdes can be on the same square's color. A2: Same as A1, but for each of the total number of pieces, up to 10 pieces in total. B1: Best problem in x moves, where one has a solution in x-1 moves, but no solution in x moves (check out Cornel's TT2 tournament for more info). B2: Same as B1, but for each of the total number of pieces, up to 10 pieces in total. a) More moves, the better. b) Less total pieces the better. c) The date of sending. d) The flip of an (unbiased) coin. Example: A2/5/20/[Stipulation] means: Category A2, 5 pieces in total (including the kings), the solution is 20 moves long, and the stipulation is given at the end. For the categories A, B, the condition will always be: Circe PromOnly si nd tr s.
The PromOnly condition simply states which pieces one is allowed to promote to, thus the three marine pieces, plus the knight. This is of course a very simple example, with two slight problems as the Triton at c6 doesn't move at all during the solution, and both the Triton at c6 and the Nereïde at e4 are actually not needed in the position. One can nevertheless see how the Black King can pass the h7 square, which is not guarded by the Nereïde contrary to a Bishop. 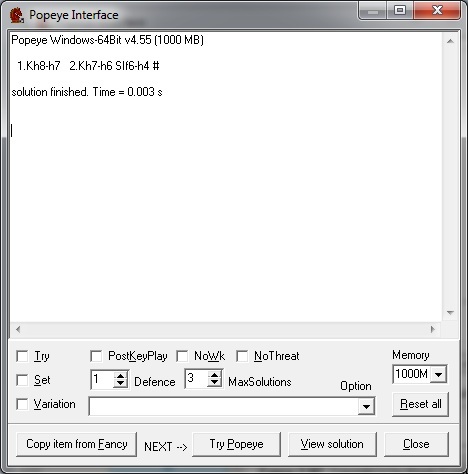 Once the position and the informations are set, one needs to click on "Popeye".